In Part 1 of this series, we talked about why small businesses need employee handbooks in place. So, we know there are federal and provincial employment laws that mandate employers to have certain policies in place and a handbook is the simplest way to comply. Plus, a handbook`s provide answers to a multitude of questions your employees will have about your culture, pay and attendance, time off, and much more. So what’s the problem? There Boring and No one reads them! Even though employee handbooks are necessary, some would say crucial, the truth is that most employees never open them. Why? Frankly, traditional handbooks would an isonomic to sleep, they’re so boring. To many of them are filled with legalese and read like crusty old textbooks. The sad part is, these handbooks are often the first impression of a new employee gets of your company. You might as well say to them, “Here is the employee handbook, read it, sign-off on it and be assimilated.” (Brrr!). Is that how you want to welcome your new employees to your company? Here are five tips to improving employee handbooks today and making it readable. Remove the accusatory and legalese language. Even though some policies are legally required they don’t have to read like a piece of legislation. Write the handbook as a guide, talk about the culture you want to create and the rules that everyone must follow. Incorporating this one tip alone will make your handbooks much more understandable and readable. Remove or tone down all wording that sounds like you’re giving a direct order, accusing someone of something or engaging in some form of contract. Sure, some policies may need stronger wording to stress their importance. But, generally speaking, the language should be conversational. You want to stay away from making the handbook an “employer verse employee” document. I know, I can hear the employment lawyers now … “you must mitigate your risk”. True, but not at the expense of alienating your employees. You want to communicate in a clear positive tone and set reasonable expectations. Beware of online templates. If you intend to jumpstart your project by using an online template of employee handbooks, just make sure you adapt it to your business needs. Many of the templates available online were written in the United States and include wording such as “employment at will”, which is not legal in Canada. It’s always a good practice to have your completed employee handbook legally reviewed. Save the trees. We live in the digital age; hard-copy handbooks are a waste of resources and time. Having your employee handbook located on your intranet makes it easy for employees to search for information they need. When the document is searchable it will save you and your managers tons of time having to answer the same HR questions over and over again. Another advantage to having your employee handbook in a digital format is that it’s much easier to update. Legislation is constantly changing; how many times has the Health and Safety or the AODA laws changed in past few years? You get my point. Also, keeping track of the revisions is a breeze when you use digital formats. Keep it short. I’ve seen handbooks that are over 300 pages in length. Page after page of pure text! That’s not a guide. That’s a novel! If certain policies need to contain more involved wording. Then split them off into other more detailed documents and reference them through hyperlinks. Incorporating links to additional policies, legislation or even more detailed examples can make the handbook much more reader friendly. Again, including only those policies that are important to the business is essential. Too many rules and consequences only scare the heck out of your people. If you stick to the policies that are required both by law and that make sense for your business, you’re guaranteed to keeping the handbook short and less intimidating. Add media. To make the employee handbook more accessible to all, consider using visual aids. Many organizations are including pictures and videos in their handbooks. With videos being so common place, not including them in your employee handbook would be a huge mistake. Many of us are visual learners, so increasing the number of images will only improve the level of understanding. For example, it can be difficult to describe your corporate culture in words. However, a short video can give glimpses into your corporate culture in just a few short minutes. Employee handbooks will never make the best seller list, but we can make them less boring to read. It’s a new era, so let’s dump the old traditional employee handbooks in the garbage and start fresh. Your employees will thank you! Question: What do you think, do employee handbooks have to be boring? Please share in the comments below. Are you’re wondering which sections you need to include in your employee handbook? 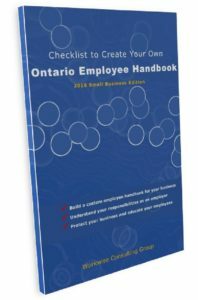 Check out our FREE Ontario Employee Handbook Checklist for a complete list of required and nice-to-have policies.